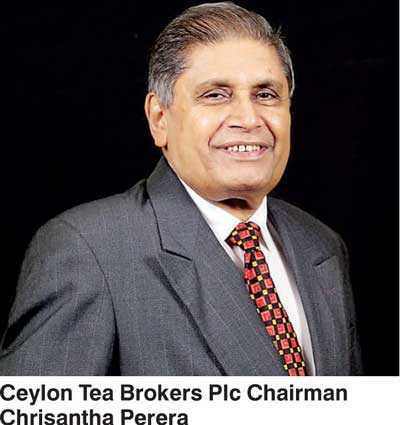 Ceylon Tea Brokers PLC has posted best ever results during the financial year ended on 31 March 2018, in addition completing and kicking off several key initiatives. After tax profit crossed the Rs. 100 million mark to stand at Rs. 107 million, up from Rs. 41.5 million in FY17. Revenue grew from Rs. 420 million to Rs. 656 million. Value of tea marketed via the Company was Rs. 22.4 billion, up from Rs. 16 billion in FY17. “During the financial year, the Company was successful in raising additional equity of Rs. 205.2 million through a Rights Issue in February 2018, by offering 68.4 million shares at Rs. 3 per share. The encouraging response by our shareholders must be appreciated, which enabled this Issue to be over-subscribed. “As indicated in last year’s Annual Report, the Company is in the process of constructing a state of the art warehousing complex which consists of 12,000 pallet locations under its fully owned subsidiary Logicare Ltd. The objective of this project is to cater to the Company’s total warehousing requirement, as well as to provide third party logistics services. The approval of the Board of Investment of Sri Lanka for this project was obtained during the year under review. This facility is designed to reduce our carbon footprint, which is in line with our commitment to environmental sustainability. Commercial operation is expected to commence in early 2019. “Our quest for continual improvement encompassing both professionalism and service quality gathered momentum with our listing on the Colombo Stock Exchange in 2010. Having a public holding remains a major step in releasing the full potential of the business to meet our aspiration to be a leading Tea Broker in Sri Lanka. The Public Listing was very much against the tide at that time, as stand-alone broking companies were privately held entities. The decision to be public-listed brought with it other concurrent commitments of transparency, accountability and good governance practices, which helped us to build the image of a reputed and reliable partner to the many factory owners who dominate the Low Grown Tea sector in particular. We also set out to build a dynamic and forward looking young team with a blend of quality and experience. With these strategic initiatives, we were able to win the confidence of Tea factory owners servicing the emerging network of growers. We are now a dominant partner in the Low Grown segment at the Colombo Tea Auctions. “The recently concluded Rights Issue of the Company, which was fully subscribed, resonated the confidence we have built in the Stock Market. The Company was also the proud recipient of the Silver Award in the Service Organisations Category at the 53rd Annual Report Awards of the Institute of Chartered Accountants of Sri Lanka in 2017, having received the Bronze Award in 2016. “We have therefore now come of age and earned our position as a reliable and solid business partner. 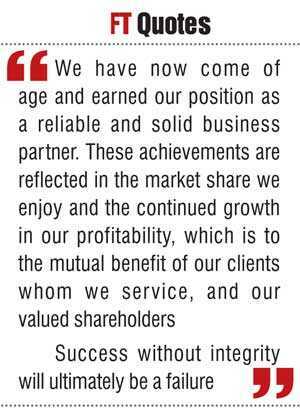 These achievements are reflected in the market share we enjoy and the continued growth in our profitability, which is to the mutual benefit of our clients whom we service, and our valued shareholders. 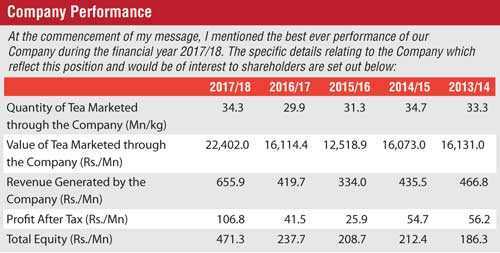 “Having built a sound portfolio in the Low Grown Sector, with the confidence we have acquired we will endeavour to make inroads into the High and Mid Grown categories in order to build a balanced catalogue. We are also improving our technology base to cover all areas of the Tea Industry, which will further strengthen the relationship with our clients, by helping them to unlock value in order to obtain better prices, as well as improve productivity in order to be cost effective. Funding is also a major sector of our business, with revenue from advances to clients matching our broking income. “The state of the art warehouse complex now being set up through a subsidiary, Logicare Ltd., with Stage I scheduled for completion in early 2019, will further boost our position in the market. In addition to providing our clients with a professional warehousing service, we hope to develop this unit as a Logistic centre during the second stage, thus creating an added source of service and revenue. 13.5% of total export earnings, compared with $1,269 million amounting to 12.3% of export earnings in 2016. The Sri Lanka Tea Industry Table reflects the improvement in our national Tea production, which disappointingly fell below 300 million kilos in 2016 which was the lowest since 2009. All three elevation categories contributed to this increase, with Low Growns recording the greatest improvement. It would however be noted from the Table that we are still short of the all-time record figure of 340 million kilos, achieved in 2013. At the time of compiling this review, there has been a welcome increase up to April 2018, and it is hoped that this impetus would be maintained for the rest of the year. An encouraging aspect to this expectation is the recently announced lifting of the ban on glyphosate, which from the reports we have received, would be made available to the Tea and Rubber sectors. This would have a positive impact on crop intake by permitting the use of this important weedicide, with the consequent benefits that would be derived from other agricultural practices, including fertiliser application. The Colombo Auction Averages and Dollar Weighted Average tables reflect all-time highs at the Colombo Tea Auctions, both in terms of rupees per kilo as well as the approximate dollar equivalent. The same momentum was maintained at the beginning of 2018. At the time of compiling this report, however, a declining trend has been observed. This drop is even more pronounced when expressed in terms of the dollar equivalent, following the depreciation of the Sri Lankan rupee vis-à-vis the dollar in 2018, compared with the corresponding period last year. 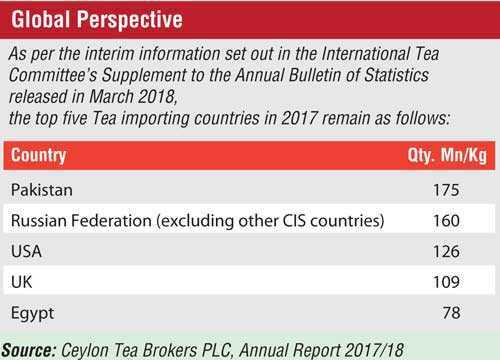 The Tea Exports Earnings table could be considered most encouraging with total export earnings of $1.53 billion, reflecting a fairly sharp increase on the comparatively disappointing realisation in 2016 of $1.27 billion. It must however be pointed out that Sri Lanka has enjoyed export earnings of $1.63 billion in 2014, which underlines the potential that we as a country have for substantially higher export earnings from Tea. It must also be pointed out that the quantum of exports in 2017, which includes re-exports with imported Tea, was at 288.98 million kilos, only marginally higher than the 2016 recorded export of 288.77 million kilos, in spite of the higher production in 2017. This is indicative of a higher carry over stock from 2017 into 2018, compared with 2016 into 2017. It should also be pointed out that other CIS countries have recorded imports of 88 million kilos. What is disappointing from a Sri Lankan perspective is that, barring the Russian Federation and other CIS countries, we do not have a significant presence in any of the other major Tea importing countries. 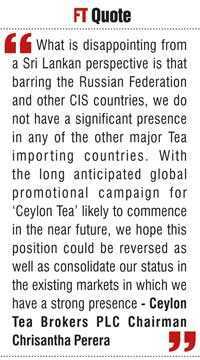 With the long anticipated global promotional campaign for ‘Ceylon Tea’ likely to commence in the near future, we hope this position could be reversed, as well as consolidate our status in the existing markets in which we have a strong presence. An encouraging feature has been the increasing Tea exports from Sri Lanka to mainland China, which in 2017 amounted to 9.9 million kilos, compared with 7.6 million kilos in 2016. The interesting factor is that whilst China is the largest producer and exporter of Tea, these predominantly comprise of Green Tea and Oolong Tea, and not Black Tea as produced by Sri Lanka. Therefore, the increasing Tea imports by China, which currently amounts to almost 25 million kilos per annum, and Sri Lanka’s gradually strengthening presence in this market, should be further developed.